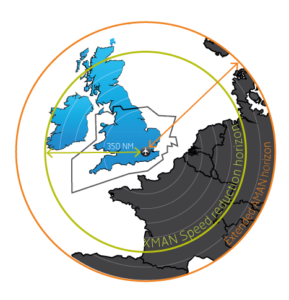 On 31st March, the UK/Ireland FAB, together with Maastricht and DSNA began a trial to extend the Arrival Management (AMAN) horizon across ANSP borders (XMAN) for traffic inbound to Heathrow. By slowing streams of arriving aircraft during the cruise phase, flights spend less time in the holding stacks close to the airport, reducing fuel burn and emissions. The trial has the overall aim of cutting average stack holding times to deliver fuel and capacity efficiencies. Since the start of the trial, NATS has recorded average delay absorption in the cruise phase nearing 1 minute for those flights influenced by the trial, which correspondingly reduces their holding time, saving airlines over £1 million (€1.25m) in fuel and 7,000 tonnes of CO2, as well as reducing noise for communities underneath the stacks. The trial has seen controllers in the UK, France, Ireland and the Netherlands working in partnership to slow aircraft down up to 350 miles away from London in order to minimise stack holding times on arrival. It is the first step of a broader strategy to reduce the amount of time aircraft spend holding at Heathrow. In December 2014, the trial entered its fourth phase, which extends it until October 2015 as we move toward full implementation. The latest results from the final phase of the cross-border arrival management (XMAN) trial indicate a significantly greater number of flights inbound to Heathrow are now able to benefit from absorbing delay whilst in the en-route phase of flight. Overall, the total time absorbed by traffic prior to entering the stacks has more than doubled compared with earlier phases of the trial, realising further fuel savings for and reduced CO2 emissions. The increase is primarily due to improvements in the way our partner ANSPs – DSNA, IAA, MUAC (& NATS Prestwick) – interpret & manage the Heathrow AMAN data. NATS would like to thank our partner ANSPs for their hard work in continuing to improve interfaces and procedures to deliver the XMAN speed controls, delivering these increased benefits. Extended AMAN is a key SESAR concept and the trial demonstrates the UK-Ireland FAB’s, FABEC’s and Heathrow’s commitment to deploying innovative SESAR concepts as part of its implementation plan, and is a practical example of inter-FAB collaboration.